The Ultra Series is years of research and development, culminated in a multi-piece cast aluminum intake manifold that offers advantages that only a modular design could allow. Using the latest in CFD (Computational Fluid Dynamics) software; Skunk2 Racing has created a two-piece modular design that allows for easy disassembly, porting, and plenum volume changes through the use of a removable plenum lid and optional plenum spacers. In addition to CFD testing, the Ultra Series Intake Manifold has undergone extensive in-house dyno testing which has led to a design that is less restrictive, yielding both torque and power gains well over many of the competitors. 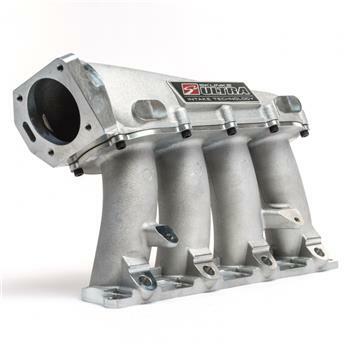 Skunk2 Racing Ultra Street Intake Manifolds are cast-aluminum, manufactured from high-grade 356 aluminum alloy for strength and lightweight. Each manifold is CNC-machined for a precise fit, and individually inspected for quality assurance. The Ultra Series Street manifold features a generous throttle body opening and is constructed with thick walls at entry, minimizing concerns of breakthrough when port matching. Intense planning and design went into the plenum to distribute even airflow to all four cylinders under dynamic load conditions. Placement and design of the velocity stacks were rigorously flow tested to ensure maximum delivery of air to the cylinder. Large velocity stack raised bell mouth entries lead to intake runners with smooth transitions allowing the Ultra Street Intake Manifold to really move some air! Skunk2 Racing Ultra Street Intake Manifolds are designed to be used in modified naturally aspirated applications as well as mild turbo/supercharged setups.